The Tampa Bay History Center is found on the Riverwalk of the Channel District in Tampa Bay, Florida and features 12,000 years of Florida and local Tampa Bay history, the Witt Research Center, shopping, dining, and an event hall. 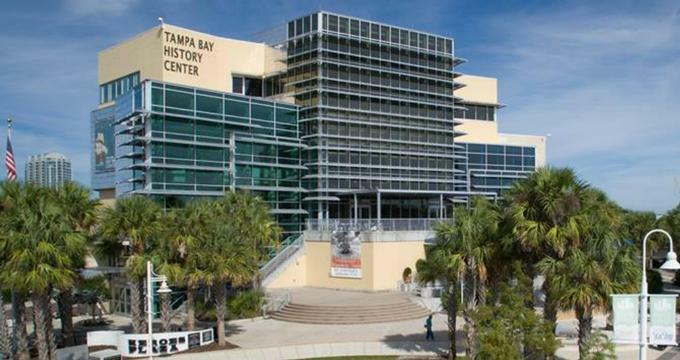 The Tampa Bay History Center is a Smithsonian Affiliate organization featuring interactive and educational exhibits and programming highlighting 12,000 years of Florida history. The History Center has access to over 130 million artifacts in the Smithsonian’s collection that are featured in both permanent and temporary exhibits. Nearly 3 million Hillsborough County residents and tourists visit the History Center annually. The building was also awarded a Silver LEED certification in 2012 as being Green from the U.S. Green Building Council. The History Center sits on reclaimed land and is built from recycled materials. The bricks in the parking garage are recycled from historic streets in Tampa and the center features optimal natural lighting through glass windows and recycled rubber flooring, smart lights, and other green resources. The collection at the Tampa Bay History Center features artifacts, artworks, and documents with a relevance to Florida and the region. The collection begins as early as the prehistoric Gulf Coast and reaches to modern day through all spheres of life. Some collections are only available to educators and many of the artifacts are on loan through the Smithsonian. The permanent collection owned by the Tampa Bay History Center holds more than 60,000 objects. Donors can adopt artifacts in need of conservation. The History Center is two floors. On the first-floor Visitors will find permanent exhibits related to the first people of Florida and original artwork by Theodore Morris, Panfilo Narvaez’s landing at Tampa Bay almost 500 years ago, European exploration of Florida, Spanish and French settlers of the 16th century, Seminole War and Native cultures, and Cigar City. The second-floor exhibits include history local to Tampa Bay, cattle ranching, natural resources of the bay, recreational and social activities in the area, civil rights, urban development, and wars since 1830. There is also a hands-on discovery center based on the novel A Land Remembered, The touchton Map Gallery, and A gallery of artworks from local school children on the second floor of the History Center. The Tampa Bay History Center offers many different options for family and educational programming throughout the year at the facility. All events are on the website calendar with annual special events occurring on Mother’s Day, Father’s Day, Independence Day, Smithsonian Museum Day. There are also special fall events for trick-or-treating and Holiday celebrations in December. History Adventure Camps- These summer camps are offered to children age 7-11 and includes tour of Ybor City, field trips to cultural site, lectures by historians and educators, and many hands-on activities. Each camp is one week long. There are also American Girl, Archaeology Mystery, Pirates and Explorer, Museum, and Hysterical History themed summer camps from June until August annually. My Doll and Me- This program is designed for children age 6-12 and requires preregistration. Parents drop of children for the day where they explore the past with their dolls and tour the museum with a docent. Sangria and Stories- This adult program is a casual mixer to hear stories of the permanent exhibits collections with guest lecturers and adult beverages. Dinner is served before and after the presentation at the Columbia Café. Florida Conversations- This monthly lecture program explores the history, art, politics, culture, and current events of Florida with top scholars, writers, and artists. This event is coproduced by TBHC and University of Southern Florida and the Public Media and is free to the public. Book Group­- The Book group meets the third Thursday of each month and reads books about Florida that are written by local authors. Books such as history, nonfiction, and fiction, mysteries, and the environment are often read. Coffee is served before the meeting starts. Walking Tours- Docent lead tours from the History Center and through Tampa’s most historic neighborhoods are 90 minutes long and require registration. Groups of up to 25 can be accommodated. Field Trips- The History Center is best for grades 3-12 with 4th-8th grade educators finding the exhibits in line with Florida and US History Standards. A museum tour takes about 2 hours to complete with additional time for lunch or visiting the museum store after the tour concludes. Docents will lead all field trips and tours will lead students through exhibits that explore the early peoples of Florida through industry of Tampa Bay.